Some Office apps let you embed fonts in your documents. That way, if you share your document with someone else, the fonts, layout, and styling of the document won't change, and special characters won't turn into meaningless rectangles. Click the File tab and then click Options. In the left column, select the Save tab. At the bottom, under Preserve fidelity when sharing this presentation, select the Embed fonts in the file check box. Leaving that check box blank (or selecting Embed all characters in Office 2007) increases the file size, but is best for allowing others to edit the document and keep the same font. Selecting Embed only the characters used in the presentation reduces the file size but limits editing of the file using the same font. What about embedding fonts in Excel? When embedding a font, avoid using Embed only the characters used in the presentation. It is better to embed all the characters in a font so that another user can successfully edit the file, if necessary. Use OpenType (.OTF) or TrueType (.TTF), if possible. OpenType fonts consume the least storage space when embedded in an Office document. Avoid embedding Postscript fonts (.PFB, .PFM) if possible. Some users report having difficulty opening an Office document that has a Postscript font embedded in it. Is your font installed? Make sure the font you want to embed is installed by double-clicking it and selecting Install when Windows Font Viewer opens. Is embedding your font still not working? Not all TrueType fonts can be embedded. Font creators can set different options for their fonts, including: Non-embeddable, Preview/Print, Editable, and Installable. To see what level of embedding your installed font is, go to Control Panel in Windows and click Fonts. Clicking on the font shows the Font embeddability setting. Is your file size too large after embedding fonts? Certain fonts can be very large compared to others, so if file size is a concern, consider using alternative fonts. If you want to remove the embedding, you can turn off the Embed setting in the File > Options dialog box (described above) and save the file. Then, once you close and re-open the file, a different font is substituted for the font that had been embedded previously. Which version of Office for macOS are you using? In PowerPoint for Office 365 for Mac and PowerPoint 2019 for Mac, you can embed fonts in a presentation. Word 2019 for Mac and Excel 2019 for Mac don't support embedded fonts. This feature is only available to Office 365 Subscribers and in PowerPoint 2019 for Mac, version 16.17 or later. On the PowerPoint menu, select Preferences. In the dialog box, under Output and Sharing, select Save. Under Font Embedding, select Embed fonts in the file. When you save the file, the fonts used in it will be embedded in the presentation file. 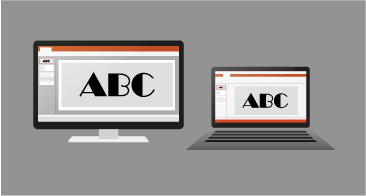 For a description of how to embed a font using PowerPoint on a PC, see Embed fonts. Is your file size too large after embedding fonts? Certain fonts can be very large compared to others, so if file size is a concern, consider using alternative fonts. If you want to remove the embedding, you can turn off the Embed setting in the Preferences dialog box (described in the procedure above) and save the file. Then, once you close and re-open the file, a different font is substituted for the font that had been embedded previously. 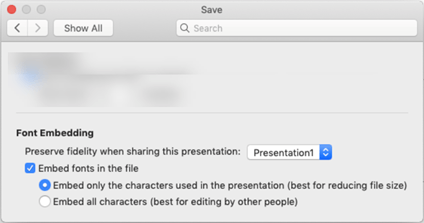 PowerPoint 2016 for Mac correctly displays fonts that have been embedded in the file. The other Office 2016 for Mac apps don't support embedded fonts. Embedded fonts aren't supported in Office for Mac 2011.